This works as a side dish to protein (chicken or seafood) or a light meal in itself, approx 3 mushrooms pp for meal, two as a side dish. Line a baking tray with foil or baking paper. Remove stems from mushrooms and discard* and clean the caps from any debris. 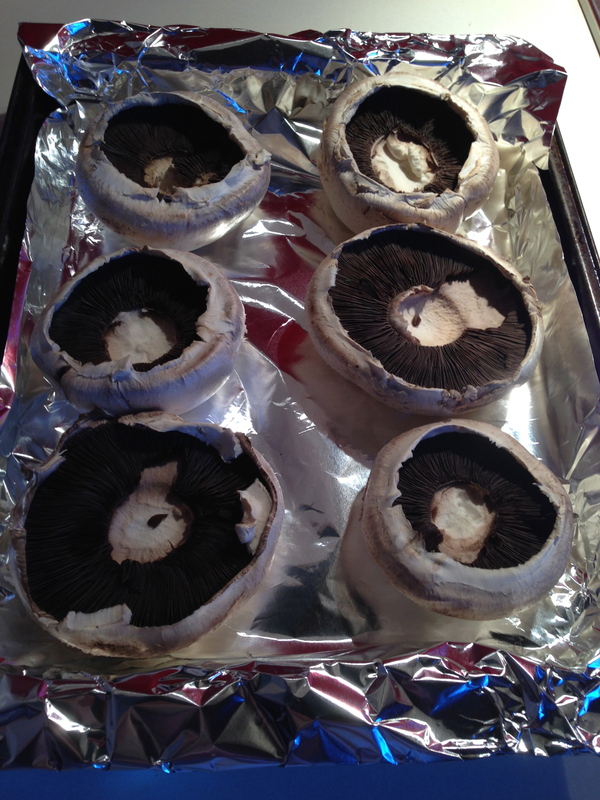 Lay the mushrooms under-side up in the baking tray. 1) In a medium sized non-stick frying pan, heat to medium and cook the bacon until a bit of fat begins to cook out of it. 2) Add the diced zucchini and celery. Cook, stirring frequently for about 10 minutes, until the zucchini and celery begin to soften and there are a few flecks of golden colour on them. 3) Stir through herbs, chilli, salt and pepper, then add the almond meal and turn off the heat. 4) Stir through the almond meal, and allow the mixture to cool for a few minutes so you can handle it to put onto the mushrooms. 5) When cool enough to not immediately melt the cheese, add about ½ C of the cheese to the mixture and stir through. 6) Scoop about ¼ C of the mixture for the top of each mushroom, until you’ve evenly filled each one. 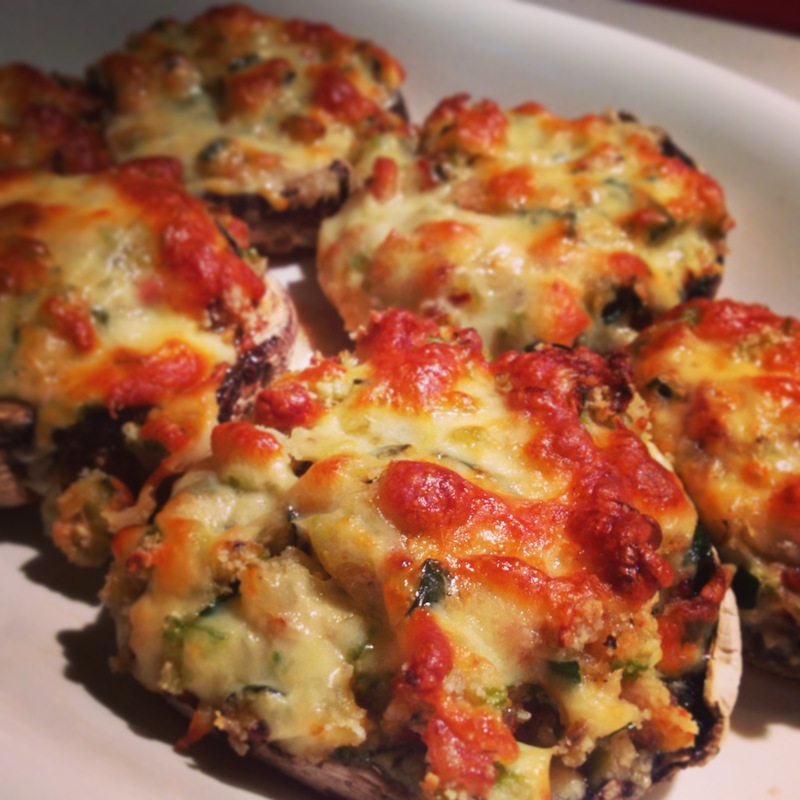 7) Divide the remaining cheese and use to top each mushroom. You might need to add a bit more, this all depends on the size of your mushrooms. 8) Bake for about 20 minutes until the cheese on top is golden and you can see that the mushrooms have collapsed slightly and are cooked. *With very large mushrooms the stems are often woody, and I have read that they are not necessarily that good for us. However, if you hate the waste and the stems are not too woody, you can chop them finely and add to the frying pan with the other vegetables. With smaller mushrooms this definitly works.